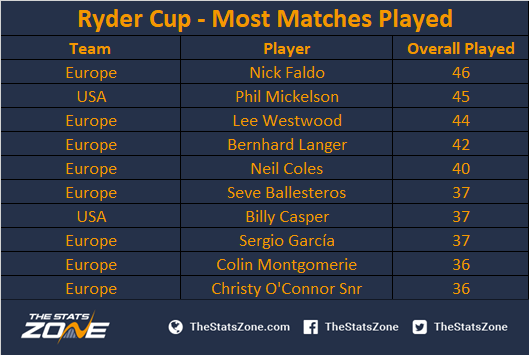 Ryder Cup Stats - Who Has Played The Most Matches? In the build-up to the 2018 Ryder Cup in France, TSZ will be publishing a number of articles which examine statistics covering the history of the biennial competition between USA and Europe. Here we look at who has played the most matches. Across the three disciplines (singles, foursome and fourball), Englishman Nick Faldo has competed in the most matches (46) and boasts a win-rate of 54.4% across his Ryder Cup career. However, Faldo is this year set to be surpassed by Phil Mickelson (45), who has been selected as a Team USA wildcard for the upcoming 2018 Ryder Cup.